I had guided Roger and Colin a few times before and in May they had caught some impressive tench from Horsehoe lake. 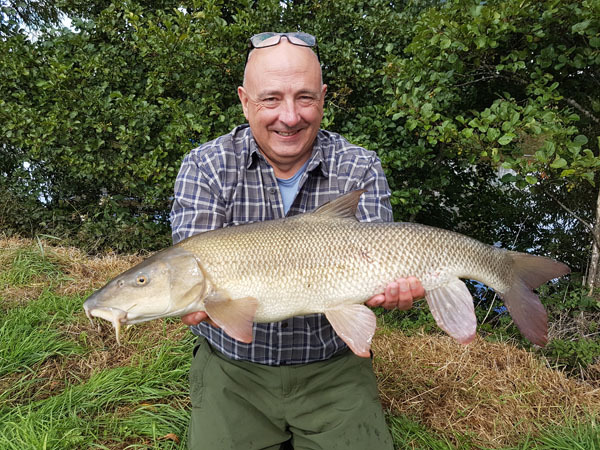 They always like a session on the river Wye for barbel. The only problem for them is because of their busy life we need to book months in advance so can never tell what the river conditions would be like. 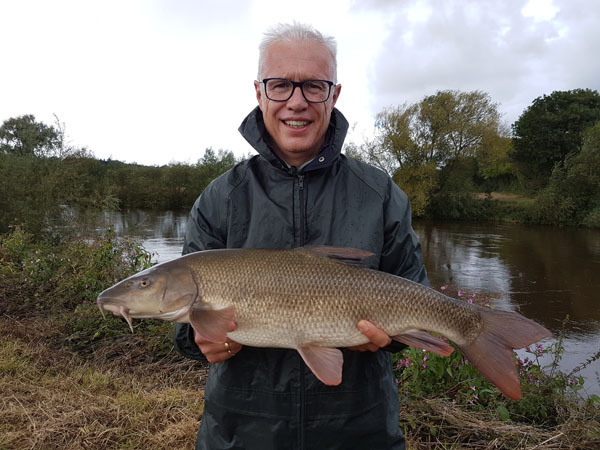 I guided them pretty much exactly one year ago to the very date on the river Wye and had caught some impressive barbel. So we met at 8.30am on a very busy section of river. The reason behind this was that the river was in flood, well up about 1.5m. And on this stretch of river there are only a handful of swims that fish well in the floods. There were already 3 anglers fishing when we arrived so had to tuck ourselves away in a swim that hadn’t fished been fished for long while judging by the under growth height. The normal feeder and pellet approach was used. 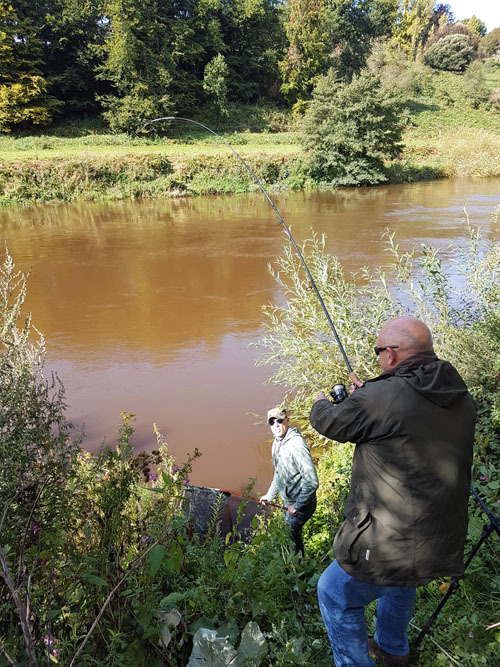 Almost straight away we had a few knocks and then the rod tip flew around and Colin was into a barbel which fought like a tiger in the fast flowing river. Roger was next on the rods and he too had a barbel quickly. There were large rafts of weed coming down plus the normal trees and other debris from the flood and increase in height. It was the very first flood of the year so plenty was coming down. They both continued to catch fish throughout the day. Nothing huge but fish to 8lbs 12oz graced the net. We even moved swims and caught a few more. At the end of the day 13 barbel were landed with a couple lost. A good days fishing. We then said our goodbyes and set up a meeting time the next day at a new venue. 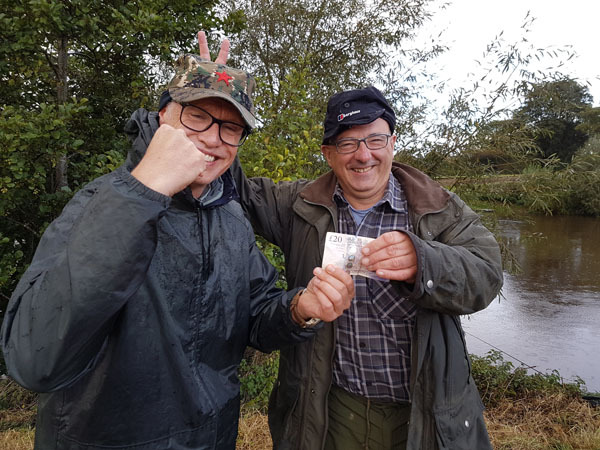 The next day a wager was made of £10 each in the pot for the biggest barbel of the day. I would keep the money and present it to the winner at the end of the session. The venue needed a long walk. I had gotten there early at 6.30am to look at the river and swims as I hadn’t fished the stretch in flood before. I had found a couple of swims on the inside of the bend out of the flow and the increasing height and debris coming down. Roger and Colin would alternate swims every 90 mins. 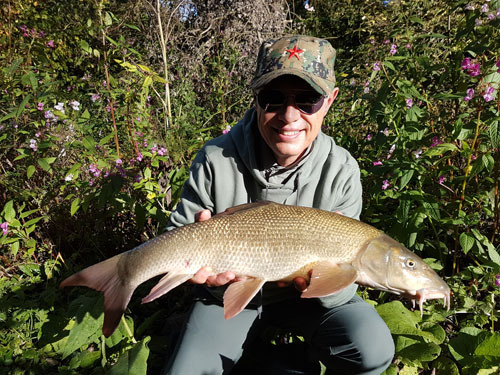 Roger was first into a barbel a little one of just a couple of pounds. Then he had another one of 6lbs so at least we were finding a few barbel. After 90mins the guy’s changed swims and this time Colin had a 6lber. The top swim seemed not to be producing barbel. But that changed when Roger hooked a good fish only for the hook to pull. They swapped and changed swims on the 90min mark and it was tooth and nail as the day went by. 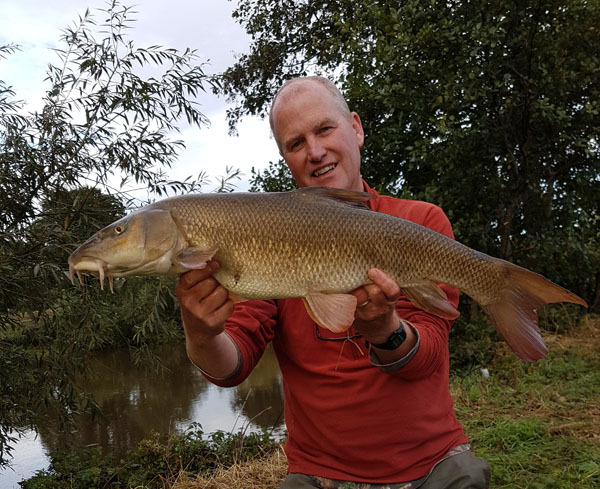 Roger caught a lovely barbel of just over 7lbs from the lower swim and the odd one was coming out from the upper one. We had lunch and a break and I was busy every now and again making tea and coffee’s plus landing and weighing barbel. Colin then had a good fight from a large barbel from the upper swim of exactly 8lbs and took the lead. Time moved on and both had to leave at 4.30pm so the presentation had to be made to Colin for the largest of the day. Kindly both carried some of the bulkier tackle back to the car as I wanted to fish on for another hour or so as I would get caught up in the rush hour traffic if I left then. The rain poured shortly after they left so I cowered under the umbrella while I waited for it to go off. I then made my way down a steep very slippery bank to the rods. Good job I had a good rope and spike stuck in the ground to aid me. I cast out both rods and had a bite immediately and it felt like a good fish. I would the other rod in while playing the fish, difficult yes and it got right out in the flow. I tried to bring the fish back in and the fight in the fast flowing water lead me to believe it could have been my first Wye double. I unhooked the barbel and left it in the net to recover. I climbed the bank getting ready the camera and scales before I lifted the fish up. On returning back down the bank I slipped and made a grab for the knotted rope. Thank goodness as the grip from my boots had me on my backside sliding down towards the river and at 8ft deep I would be submerged. Luckily I stopped myself from a dip in the river and thought that’s it I’m packing up after this. On the scales the fish went 9lbs 6oz so alas still no cigar moment for me. For the day we had 11 barbel which was excellent considering the conditions. This entry was posted on Monday, November 6th, 2017 at 6:58 pm	and is filed under Uncategorized. You can follow any responses to this entry through the RSS 2.0 feed. Both comments and pings are currently closed.